Gong Xi Fa Cai! May the year of the OX brings you an abundance of health, prosperity and happiness. May success greet your every resolutions made this year. So, how’s your new year resolutions getting on? Are you working very hard to make sure you stick to them? I certainly hope so. Many people tend to make fantastic goals and resolutions whenever a new year approaches, me included I must say, only to abandon them when they are faced with challenges along the way. Are your resolutions fading away? What if you could keep those resolutions in sight and stay motivated until you achieve a massive success? "Everything that's coming into your life you are attracting into your life. And it's attracted by virtue of the images you're holding in your mind. It's what you're thinking. Whatever is going on in your mind you are attracting to you” ~ Bob Proctor, one of the best Law of Attraction and abundance teachers in the world. Your mind works like a magnet, it attracts whatever you see to create positive or negative energy vibrations. When you radiate and send out this energy with your thoughts and feelings, the same is what you will attract into your life. The Law of Attraction is the Law of Creation. You create your entire life through your own thoughts! According the Law of Attraction, one of the most powerful ways to stay focused on your goals is to create a Vision Board. A vision board will make it easy for you to visualize your goals and dreams. It assists you in adjusting your belief system, helping you move up your emotional ladder, past self-limiting barriers to reach your goals and create the life you desire. If you’ve not done one, what will you put on yours when you do create one? 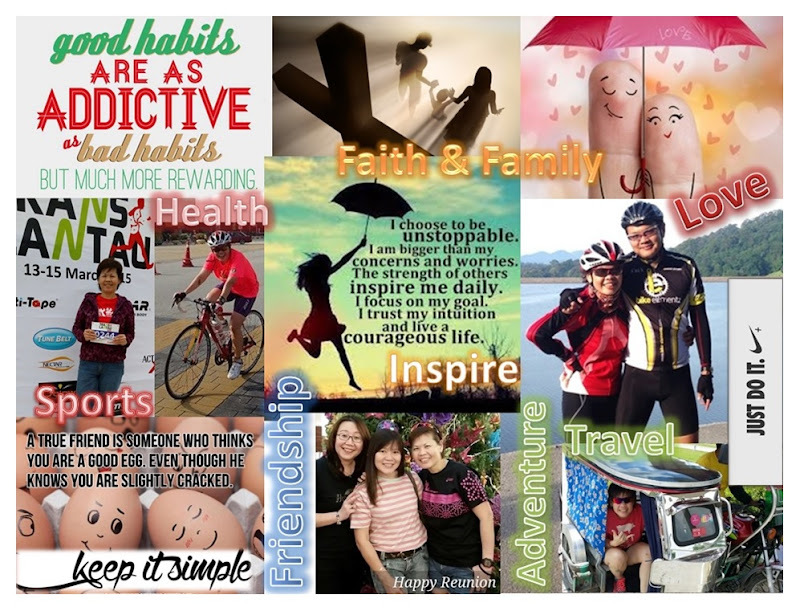 A vision board is typically a poster board on which you paste or collage images that you’ve torn out from various magazines or from your own collection of photographs. It’s very simple and you can even create one on your computer. Select images that inspire you and even better, have yourself in it. The more personal the images you use, the better the result. By focusing on your vision board on a daily basis with self-chosen affirmations, you will attract your goals to your reality. I started on my vision board sometime last year, October to be exact. It has been an on-going work-in-progress. A perfectionist that I am, I’ve changed the images so many times, I’ve lost count. But one thing’s for sure, my goals and resolutions remain unchanged. I know I’m long overdue in posting my own vision board onto this blog and proudly, I guess I’m finally ready to show it to all my readers today. It's good to know.thanks for sharing. as for me I have this IDP which I started lasy year. you can check out my site, I have a blog on that http://ondiamondmum.blogspot.com/2009/01/idp-for-2009.html thou I didn't elaborate further what are on my list.